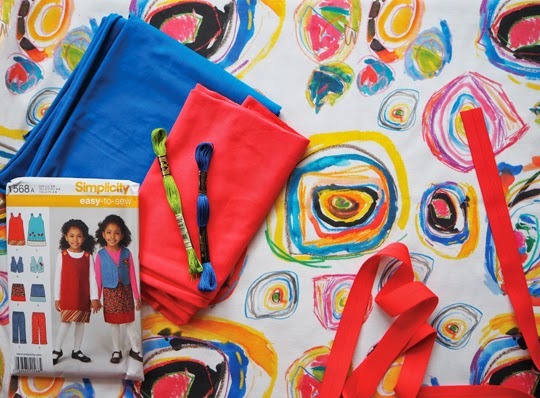 During one of the art sessions I had with my two older nieces, they drew some fun circles with crayon and watercolour that I thought would look great turned into a fabric repeat. It took a while for me to get to it – what with house-moving and study – but I did finally manage it and was super-happy with the way it turned out. 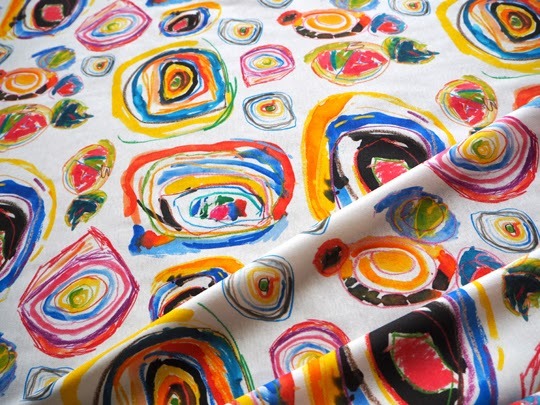 You may need sunglasses for the post from here on in – this fabric is pretty bright! 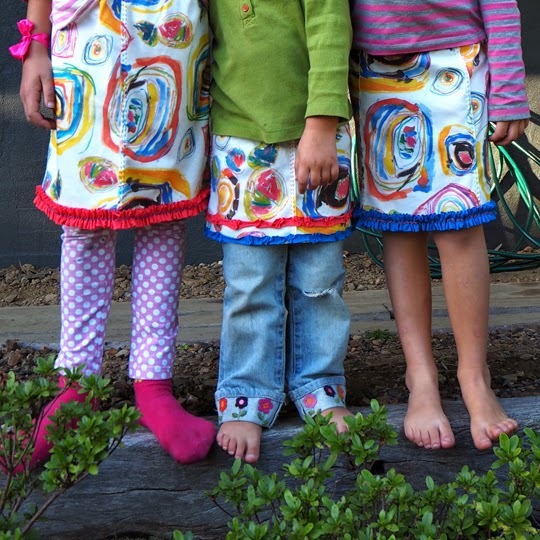 Now, a length of fabric wasn't much use to the nieces, so it had to be turned into skirts. I purposely had the fabric printed at Spoonflower (available now for sale) on an organic cotton knit so I could use some Alabama Chanin techniques in putting the them together. I did toy with the idea of creating my own pattern as well, but that all got a bit too hard once I'd committed to an Easter deadline. As you can see in the skirt pattern I chose, there is a strip of contrasting fabric around the bottom. To allow for this I just cut each of the girl's skirts the length of one a size up. So Olivia, who is seven, got a skirt length for a girl aged eight. 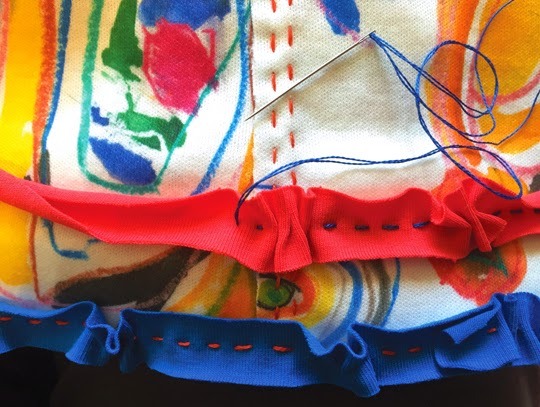 The pattern piece was for a quarter of the skirt that you would normally cut on the fold, but because I wanted a seam at the front, back and each side, I cut four single pieces from the pattern. The pattern allowed for a seam, so I included that and then added half a centimetre (one quarter of an inch) to the inside edge. 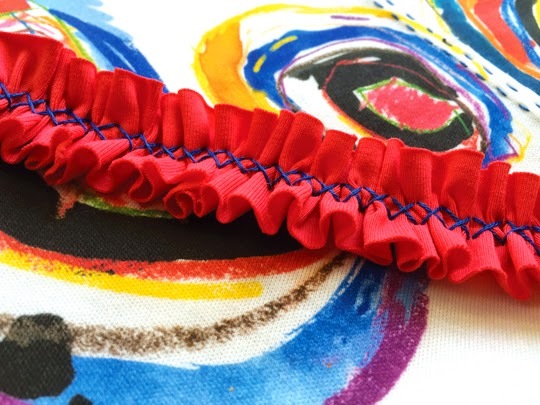 Each seam was sewn together with running stitch using two strands of embroidery thread, folded to one side and then stitched down with more embroidery thread. The two older girls got full ruffles on their skirts done in a plain jersey. These were pinned down first and then attached with cross-stitch. The gathering thread was pulled out at the end. The smallest girl got random ruffles, again made with plain jersey, in the colours from each of the older girls' skirts. And then they were done! I struggled to believe that the smallest one would fit. Honestly, each of the pieces of the skirt were the size of a pocket on my jeans. These girls rarely stand still, so I snapped this shot just after they'd opened the presents. They put them on immediately, crooked in one case, and over whatever else they already had on, but at least I got a pic! Olivia did wear hers the next day with a bright red and white striped top and it looked great. They were definitely pretty chuffed with skirts made from fabric they'd designed themselves. Happy Easter everyone! Thanks JaNeanne! I'm inspired to put a few more of their drawings to fabric now, it's been such a good result.